Blog > Did You Catch the Super Bowl Bomb? Did you catch the Super Bowl? I did. I hardly remember it. And that's not because of the excellent martini I drank while watching. It's because it was so boring. Yep. Boring Super Bowl. And, in case you're interested, I was rooting for the LA Rams. The game was boring, but the City of Atlanta was having a good time. They started closing streets about a week before the event. Friday night Lauren and I hopped on the streetcar. It was great! There were actually people riding it. We got off near the stadium and walked the rest of the way. We ran into a group of guys from Boston who asked us for some advice. We chatted with them for a while. They were nice and seemed excited to be in Atlanta. It was a boring-sky day, but we made the best of it. 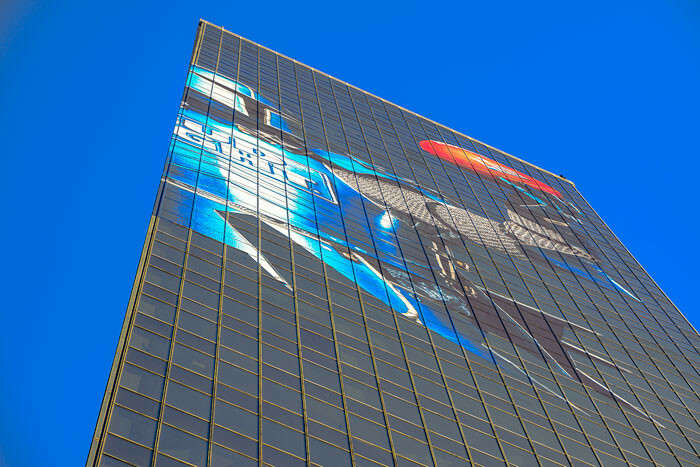 There were giant building-wrap/advertisements on a lot of the city buildings. They were pretty cool looking. I managed to get a few shots. There were so many helicopters. They've been all over the city for a few weeks now. Apparently, they were doing low-level passes getting baseline radiation measurements. Then when they measured during the Super Bowl, they could look for radiation spikes. I guess those indicate a dirty bomb or something. I'm glad there weren't any bombs since I live 2 miles from the stadium! Well...there was one bomb, but that was the game. I took these photos with my Sony a6000. I borrowed a wide-angle lens from Lauren. I only have a 55-210mm for my Sony right now. I need something a little wider. The top photo of the stadium is only one shot. I was going to layer a few shots, but they didn't line up well enough. It gave the photo a slightly blurry look. So, I decided to go with only one. I got a few full daytime shots too before the sunset. The sky was so blue and so clear. I debated whether to throw in a nice cloudy sky in the background. That's my usual preference. I love the texture of a cloudy sky. But I kinda thought I'd change it up. And the sky was so clear and blue. Did I mention the sky was clear and blue? The knight was taken at 1/100th f/8, 55mm, ISO 100, handheld. I'm struggling with the display on the Sony. I can look at the display at the back of the camera or the in-camera viewfinder (IVF). There's a heat sensor that tells the camera to show it through the IVF when your eye is near it. When it doesn't sense your eye, it switches to the screen on the back of the camera. I have trouble with it switching back and forth on its own when it senses my hand near the IVF. It's definitely taking me some time to get used to this camera. And I still use my Nikon a lot. I love that Nikon. I wish it was smaller. 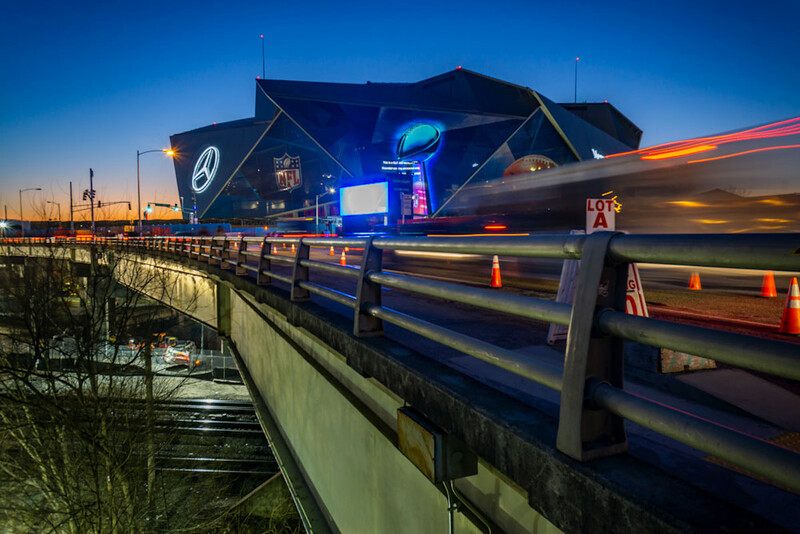 I took the photo of the Mercedes-Benz Stadium at 1.3 sec, f/10, 16mm, ISO 320 on a tripod. I edited it in Lightroom and a little in Photoshop. I enjoyed walking around the city in the run-up to the Super Bowl. It was a giant party. There were so many people everywhere! There are times when we go shooting downtown and there's hardly anyone around. Not last week. Friday night was fun. I love seeing people having a good time. The air was electric. The smell of stinkweed was overwhelming. People were laughing, shouting, dancing, drinking, and all around having a blast. Someone asked me if I had extra tickets to the Arrowsmith concert. I didn't even know they were playing! We couldn't enter Centennial Park, because we had cameras with detachable lenses. I know, right? Crazy. Did you watch the Super Bowl? Who'd you root for? Hope you had an awesome weekend. Have a great rest of your week!